COLOUR: Bay, Black, Brown, Chestnut, Grey and Roan. Piebalds and Skewbalds are not allowed. Excessive white markings should be discouraged. HEAD AND NECK: The head should be small with large kindly eyes and small alert ears. It should be well set on a good neck of medium length. The throat and jaws should be fine and showing no signs of coarseness or throatiness. Stallions to have a moderate crest. SHOULDERS: Good shoulders are most important. They should be well laid back and sloping but not too fine at the withers. BODY: Of medium length and strong, well ribbed up and with a good depth of girth, giving plenty of heart room. LOIN AND HINDQUARTERS: Strong and well covered with muscle. The hind quarters should be of medium length and neither level nor steeply sloping. The tail should be well set up. LIMBS: The hocks should be well let down with plenty of length from hip to hock, clean cut and with plenty of bone below the hock. They should have a strong second thigh. They should not be sickled or cow hocked. The fore legs should not be tied in at the elbows. The fore-arm should be muscular and relatively long and the knee fairly large and flat on the front. MOVEMENT: Low and straight coming from the shoulder with good hock action but without exaggeration. GENERAL: The mane and tail should be full and flowing. 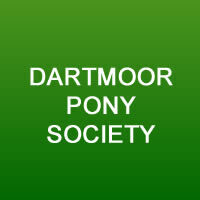 The Dartmoor is a very good looking riding pony, sturdily built yet with quality. Stallions or Colts aged three years or over may not be shown unless in possession of either a Ministry of Agriculture Licence, a DPS Veterinary Certificate or a DPS Veterinary Licence. 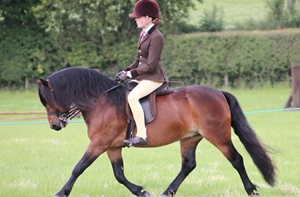 Ponies in Mixed Mountain and Moorland or Dartmoor classes must be shown unplaited. Ponies should be shown in a clean but natural state with full mane and tail. No dye or make-up may be used and no false tails. Ridden/Driven ponies may be clipped in the interest of welfare but not their legs.